Sport: The weather forecast over stated the bad weather. It was a really nice morning and then the wind picked up in the afternoon, but not as much as we expected. The morning did seem to be the most productive though right around the reservoir. The top boat was George Ashton and Jose who between them had 21 trout to the boat to 4lbs. They fished long sink tip lines and did most of their damage on weighted olive nomads. Their best area was around Willow Island. Also out on the boats were Ben Bayliss and Adam Larbalestier fishing on the drift with small ‘comp legal’ doubles and wets. They had 15 trout to the boat and Ben landed a cracking rainbow of 10lbs 2oz. (pictured below) There best areas were Newclose Bay and Curry’s Cast. On the shore there were also some big catches. Gavin McCormack had 19 trout to 3lbs on a floating line and a bead head cat’s whisker. His best area was Hollins Bay. This entry was posted in Stocks Reservoir Fishing Reports on February 28, 2015 by staff. Sport: I was a quite nice day at Stocks, we started out overcast but it brightened up around lunchtime. There was a lazy wind adding a chill to most of the day but it eventually died away to give a pleasant enough evening. Out on the boats Ryan Mathews had a great day, he started down at the Dam then across to the east bank. He caught a belting 12lb rainbow off the Alders that fought really well before succumbing to the net. He picked a few more up there before returning to Hollins and Two trees to finish off the day. He caught a total of 15 trout on mix of mini lures and wets fished on a fast intermediate line. Intermediate lines accounted for almost all the big catches today. Gary Towers had 10 from Hollins on the same with a cats whisker scoring well for him. Gary said that when he speeded up his retrieve to a strip he stopped getting nips at the fly and it started locking up. 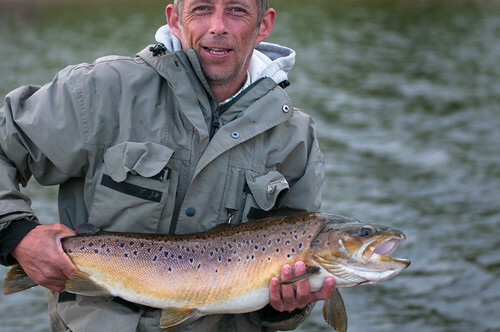 Gary Mrgan used the same method, line and fly to take 12 trout from Two Trees. Gary commented that most of the fish were taking from under his rod tip. Fred Bateman had 8 fish in short half day session from the same area on bloodworm, but he too caught on an intermediate line. The one exception was Neil Ashcroft who caught 12 good fish on an olive buzzer. His most productive are was Hollins. Just as Neil moved out to go and fish elsewhere, in stepped Dave Hitchen and he pulled out a tagged fish first cast. Dave won a free full day five fish ticket. This entry was posted in Stocks Reservoir Fishing Reports on February 27, 2015 by staff. NOTABLE CATCHES: 8 fish for John Hayes-12 fish for John Williams. NOTABLE BAG: 5 fish weighing 12lb 6oz for John Williams. BEST RAINBOW: Several weighing 3lb. BANK ROD AV: 7.00 fish per angler. BOAT ROD AV: No boat anglers today. Sport: A wet and windy morning gave way to a sunny windy afternoon with the temperature dropping as the day went on. John Hayes had a good day landing 8 rainbows whilst fishing along the bank from Bell point to Hollins bay. John found a black and green tadpole to be his most effective pattern. Landing 12 fish was John Williams who caught the majority of his fish in Hollins bay and next to the jetty. John fished with an intermediate line with various flies including Montana, orange fritz and a damsel and kept varying the depth with some trout taking as soon as the flies landed and others taking on the count of 20. It would be nice if the wind dropped and it was a bit warmer. See you on the water Paul. This entry was posted in Stocks Reservoir Fishing Reports on February 26, 2015 by staff. NOTABLE CATCHES: 20+ Fish for Graham Bell, Mr Baxter. Yesterday’s weather was such that there was a turnout of only three anglers throughout the day, all fishing from the bank. Anthony Dover braved the wind, rain and snow for a full day and was rewarded with an excellent catch of 16 fish, the majority from Hollins Bay which was relatively sheltered. Late arrivals the Birtwistles fished for a couple of hours at the end of the day and, despite the worsening weather, they both caught their bags. Much respect to you guys for braving those conditions in pursuit of your sport. Today was a completely different kettle of fish (sorry) with light winds and overcast skies. As well as a great turnout of anglers the fish were also out for action as reflected in the stats’ above. Graham Bell had an impressive bag including a 6lb rainbow aswell as the double figure specimen pictured. Graham was fishing a fastglass line and damsels. Also entering the ‘doubles club’ today were Bob Fitzpatrick and Pete Whittle, finding their ‘monsters’ in The Northern Shallows and Heron’s Hurdle respectively. Pete was on the bank whilst Bob’s was from the boat. Ken Whiteside’s 9lb+ rainbow from Bell Point must also be worth a mention. Other notable catches were Graham Harts 15 fish all taken on buzzers from Ben’s Beach and Hollins. Similarly Steve Boothby had 15 fish from the jetty area all on a Pitsford Pea. Top rod of the day from the bank however was Mr B Baxter with 23 fish taken pulling lures. The sport is truly excellent and the fish are in 1st class condition, something that many have commented upon. Don’t miss out. This entry was posted in Stocks Reservoir Fishing Reports on February 25, 2015 by staff. The snow showers that came in yesterday afternoon continued this morning until about midday as the wind strength steadily increased. The sun showed itself mid afternoon and all commented that this slowed the sport considerably. Conditions were not ideal for being outdoors however the hardy souls that did venture out to fish were rewarded with some excellent sport and fine catches. Pulling lures of various patterns caught fish, as did dries and buzzers which accounted for many of the fish caught by Jo Halton and Terry Worthington. Terry made particular mention of the Shipman’s buzzer. Messrs Tyndall and Greenwood had a hard day’s sport bringing 12 to the boat between them, the wind speed and direction making it difficult to find a good drift . The forecast is for it to be breezy again tomorrow and then much calmer from Wednesday. Windy or not the sport is excellent and with Stocks being the shape it is there is always somewhere to find shelter, whether on the boat or bank. This entry was posted in Stocks Reservoir Fishing Reports on February 23, 2015 by staff.